Your favorite family watering hole is topographically laser cut into this birch plywood server. The pretty river near your grandparents' house. The lake in the woods where you—shhh—skinny-dipped. The waves at your weekend hideaway, lapping beneath the dock. 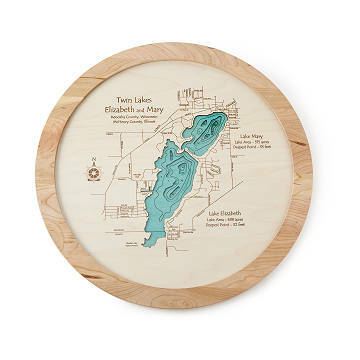 Your favorite watery heaven is topographically laser cut into this birch plywood lazy Susan, with lines tracing familiar roads, towns, and neighboring states. Topped with glass, it makes a sentimental gift for the family who lives for that summer sunset swim. Handmade in Harbor Springs, Michigan. Dust wood with a soft cloth, clean glass with soft cloth and glass cleaner.